Expensive molds kept The Legend of Zelda Legos from becoming a reality. Lego Cuusoo is a voting process that gives fans a chance to propose and plan new Lego sets. Previous successful Lego Cuusoo campaigns include the Minecraft Legos, so it's not unusual to see video game properties make their way onto the Cuusoo site. Earlier this year, The Legend of Zelda was proposed as the next Lego Cuusoo project, and received 10,000 votes of support after months of planning. Sadly, though it was close to success, The Legend of Zelda Lego set was ultimately rejected. 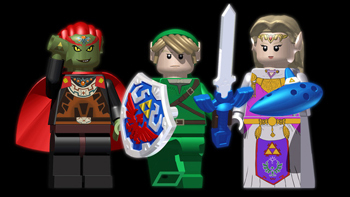 On the Lego Cuusoo site, the team thanked participants for their ideas, but stated that after review, The Legend of Zelda Legos were not meant to be. The reason? "Multiple new element molds would be required to create the minifigures for such a product, and the expense of these molds means that the Legend of Zelda project unfortunately does not pass the LEGO Review on the basis of the business case." Basically, it would be too costly to create minifigs of Link, Zelda, Ganon, and their Hyrule buddies. Something similar happened earlier this year, when Lego Cuusoo rejected the Firefly Lego set proposed by fans (only in that case, they didn't feel the property was age-appropriate). The news isn't all bad, though: instead of Zelda, the Cuusoo team chose a Back to the Future Lego set, including a Lego DeLorean. It's a shame we won't get to see more video game properties become Lego-fied just yet, but at least we'll have a neat Lego time machine.